For parallel computing platforms that use checkpoint restarts, the limited amount of checkpoint time allotted has traditionally forced admins to choose between performing less frequent checkpoints—meaning losing more time on a restart—or using a higher-performance file system as clusters become larger. That is, until “burst buffer” was developed. 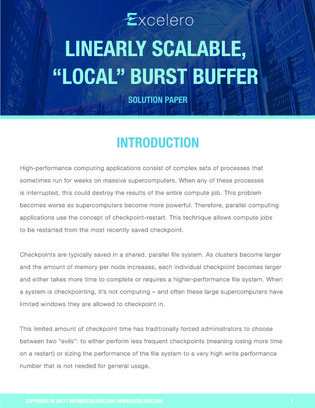 Read this white paper for several methods of building burst buffers for checkpoints, including one that takes advantage of NVMe technology to support large-scale modeling, analysis, simulation, and visualization.